Christmas relentlessly carries us back. It is a manger of memory, a stable of family and church traditions, a place, as Bethlehem was, to which we return to be counted among our people, our tribe, the ones who shaped us. This past Sunday we finally pulled out the ornaments and decked the tree in a garland of storytelling, recounting the provenance of each keepsake. “I made this in Mrs. Vorheeses’ kindergarten,” I said, tenderly lifting up a round disk embedded with a small picture of Mary and Jesus. I still remember cutting that picture out, then baking it in a bubbly clear resin that surely was highly toxic. “We know. You say that every year,” my daughters replied. Teenagers clearly don’t understand nostalgia’s undertow. My deepest Christmas memories transport me to my grandparents and to my aunt and uncles in Winston-Salem, NC—all stalwart Moravians, my distant tribe. My Aunt Janet and her sons baked the thinnest, spiciest Moravian ginger cookies, using cookie cutters that my great uncle Pete, the tin smith at Old Salem, crafted by hand. Though I haven’t had a homemade Moravian cookie in years, Christmas will always taste like a crisp ginger explosion; it smells like hand-dipped beeswax candles that we lit at the traditional Christmas Eve Lovefeast; and it looks like the Moravian star. Each December, the Moravian star hung on our porch over our front door, and on my grandparents’ porch, and my aunt’s and uncles’, offering us the blessing of light as we came and went. It still hangs over Calvary Moravian Church’s portico, and along the streets of Winston Salem. Historians claim this 26-point Great Stellated Rhombicuboctahedron originated as a geometry class project for Moravian students in 1830s Germany, fitting, I suppose, as it shines for those of us struggling to understand the measure of things, to seek where lines intersect, to navigate hard angles and all things obtuse. 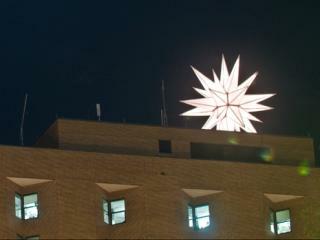 As I was thinking about this post and Googling “Moravian Stars”, I was stunned to learn that the world’s largest Moravian Star, a 31-foot, 3400-pound aurora, is lit every advent and Christmas season on top of the North Tower of Wake Forest’s Baptist Medical Center. Where my mother gets her ALS care. Where my friend Stuart has been getting daily radiation therapy for a brain tumor for the last 2½ months. Where Ann—married to my cousin Bill who keeps the Moravian traditions alive through Salem Candle Company—is battling end-stage breast cancer. May this star’s light bring clarity, peace, resilience and 26+ points of holy razzle-dazzle to each of them, and to all of us who know darkness, who crave warmth, calm and meaning in this harried advent season. ~ by Stephanie on 12/14/2010. Sigh. And amen. What a beautiful post. Stephanie – Moravian stars have special meaning in my family as well (without the historical significance). 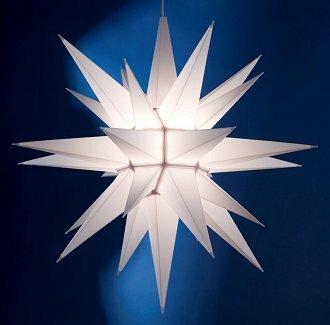 My mother had a ceiling light moravian star in her home growing up and then installed it in our home. I now have one, as does Evie. Stars burning steadfast and bright seeing us through difficult times – that’s what we all need. At David’s church in Huntsville, we use to worship with a Moravian Love Feast each Christmas – dressed candles, Winkler’s buns and sweet coffee – one of my fondest Christmas memories and another way to “mark our passages by communal rituals.” Prayers from your family in Virginia, Vermont and New Hampshire at this time of love sharing and blessing and gratitude.